"Add extra day or two in jungle Too much traveling for too short of time"
"This was a fantastic tour! I loved the itinerary. It included everything from seeing..."
"Really good! The tour leaders all really cared for our well being. I’d like to..."
"Recently returned from this amazing tour. 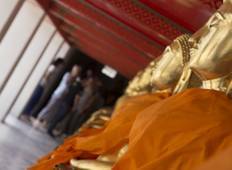 Husband and I were a little apprehensive,..."
"I had a great time on the Explore Northern Thailand tour. I liked experiencing all..."
"Had an amazing time with amazing people! The fun and energetic personalities of the..."